The French overseas territories are some of the richest areas on the planet in terms of biodiversity.1 They represent 97% of France's marine area, which is the second largest in the world, and the stakes are high to protect and sustainably manage this natural heritage. 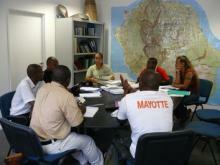 As a result, many protected natural areas have been set up by French overseas local authorities. Site managers in these areas are confronted by many difficulties. To meet the support requests of overseas managers (lien sous-rubrique gestionnaire), we initially drew up an inventory of their needs. In 2006, more than 80 people responded to our survey. The results of this survey were synthesised, which enabled the foundations of a programme corresponding to their objectives (lien sous-rubrique objectifs) to be clearly defined. In this way, we started a network for disseminating information, technical exchanges, training, and cooperation. secure the financing needed for the programme. 1Biodiversity and conservation in French overseas local authorities, O.Gargominy (Editor), IUCN France, Paris, 2003.